The Bradford vanity has a tempered glass sink, medium walnut finish and a counter top. It measures at 40-inch W x 22-inch D x 36-inch H with installation measurement tolerance (+/- 1/2-inch) It features soft close hinges. Well-constructed, stylish and offering plenty of storage space, this vanity is a great addition to your bathroom. Package comes mostly pre-assembled but some assembly is required. This vanity is the ultimate in style and convenience. Its contemporary and sophisticated look will transform any bathroom. As an added bonus, this wall-hung unit will leave your bathroom feeling ultra-spacious. Countertop space leaves plenty of room for soaps, hand creams, and trinkets, while the integrated towel bar provides a space-saving and stylish place to keep your hand towels! 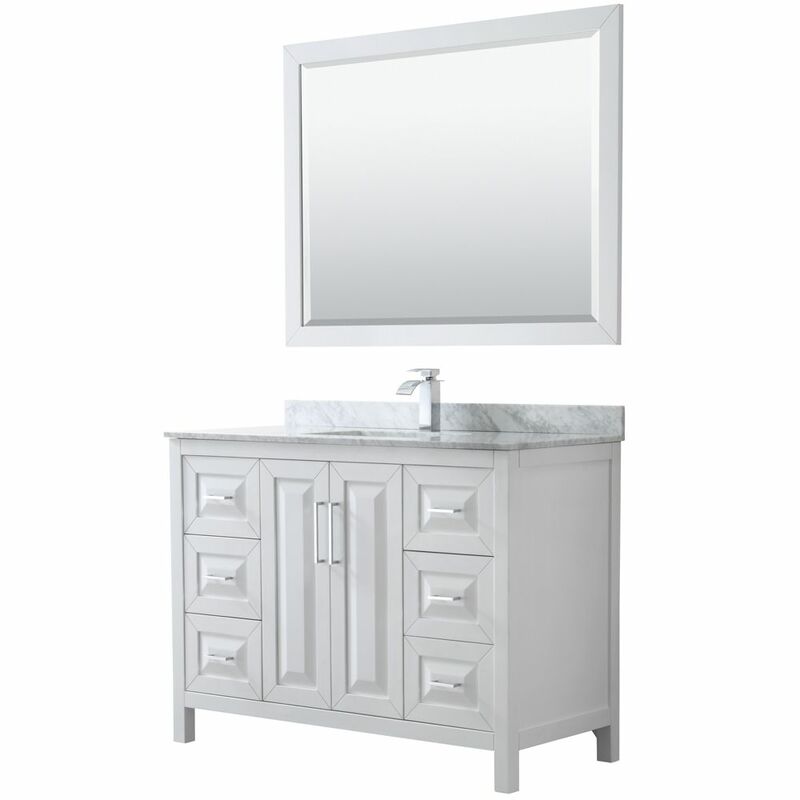 Daria 48 inch Single Vanity in White, White Carrara Marble Top, Square Sink, 46 inch Mirror The beautiful Daria collection vanities stand out in any bathroom with strong, clean lines, raised panels and elegant counters with square sinks. There's plenty of cabinet space, the fully extending drawers are dovetail construction, and chrome detailing completes the look. Daria vanities deftly combine the function of today with a nod to the elegance of the past. It's the new modern classic styling with a contemporary twist.